Many dangers can arise from reading a letter written to someone else, and epistles—scriptural letters—are no different. 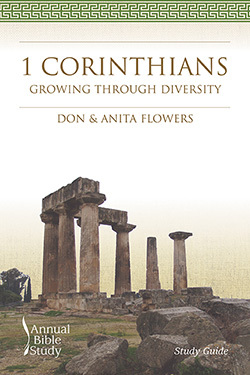 Don and Anita Flowers present this comprehensive study of 1 Corinthians, filled with scholarly insight and dealing with such varied topics as marriage and sexuality, spiritual gifts and love, and diversity and unity. The authors examine Paul’s relationship with the church in Corinth as well as the culture of that city to give context to topics that can seem far removed from Christian life today. These four sessions direct learners toward the blessings the modern church can glean from this letter to an early church from the most recognizable and prolific ancient theological writer. Although not written to us today, the authors reveal how profoundly 1 Corinthians is written about us. Don Flowers is a golfer who occasionally stumbles into par, a sailor who seeks to avoid the sandbars, and a pastor who often catches a glimpse of the kingdom of God in the life of Providence Baptist Church on Daniel Island in Charleston, South Carolina, where he serves as pastor. Previously, he has served churches in Lenoir, North Carolina, and Greenville, South Carolina. As an extension of his ministry, he serves as board member emeritus for the South Carolina Campaign to Prevent Teen Pregnancy. Anita Flowers is a writer, quilt maker, textile artist, and poet wannabe. Trained as a counselor and therapist, Anita is an associate with Pinnacle Leadership where she coaches individuals and groups forward into new possibilities, exploring creativity, writing, and vocational choice and development. Don and Anita have two adult daughters who continue to bring joy and adventure into their lives. This Teaching Guide for the Smyth & Helwys Annual Bible Study on 1 Corinthians includes teaching options, suggested worship and sermon outlines, and approaches to leading discussions and group study. The study also includes relevant lesson plans for including children and youth in a congregational study of 1 Corinthians. The Study Guide for the Smyth & Helwys Annual Bible Study on 1 Corinthians serves three purposes: to educate the learner on major issues of appropriate interpretation, to offer an overview of theological themes, and to build the learner’s Bible study skills by reviewing significant interpretations.